Although initially, the feast of Saturnalia began on December 17 in ancient Roman times, it was later expanded run to December 23. The Roman god, Saturn, presided over several aspects of life, including agriculture, wealth, liberation and time. As such, his festival period was a time to exchange gifts and engage in social activities otherwise not acceptable. Slaves were allowed to reverse roles with their masters during feasting and were allowed free speech. The traditional Roman toga was replaced with brightly-colored Greek synthesis, or cenatoria (dinner wear). Citizens and slaves alike were allowed to wear the pileus, as opposed to the bare-headed norm. During the festivities, gambling and playing dice was permitted by everyone. It was a time of over-eating and over-drinking. Horace wrote two satires set during Saturnalia, where the slave criticized his master. Such free-speech was permitted as everyone understood the social norms would return after the party was over. Gift-giving day, the Sigillaria, was on December 19. Gifts could be as expensive as a slave or exotic as an animal. Commonly though, sigillaria were given – pottery or wax figures made expressly for the day. Romans also exchanged candles and even gag gifts. Martial wrote about the various gifts given during Saturnalia, but also had a collection of poems to be included with gifts, much like what we do today with sending holiday cards. Saturnalia itself was a religious holiday and no public business was to be conducted on the day. It was originally 16 days before the Kalends of January – the dedication anniversary of the Temple of Saturn in the Roman Forum in 497 BC. When Julius Caesar revised the calendar, two days were added to December, thus shifting the holiday to December 17. Under Augustus, Saturnalia was expanded from one day to three, to encompass both the new date and the traditional December 19th. Under Caligula, the holiday was extended to five days. In the later Roman Empire, December 25 was celebrated as the Dies Natalis of Sol Invictus – the birthday of the “Unconquerable Sun” and the renewal of light and the coming of the new year. Even as Christianity was on the rise, Saturnalia remained popular. Clearly, many aspects of Saturnalia were adopted into how we still celebrate Christmas today, although not the darker activities of Saturn’s malevolent aspects. Macrobius Ambrosius Theodosius, an early 5th Century writer, is known for his works on Saturnalia. In it, he gives accounts of what went on during the festivities as discussions of learned men at a fictional banquet. In one interpretation of Macrobius’s work, Saturnalia had become a festival of light, leading to the winter solstice, with the burning of candles. Roman Empire. 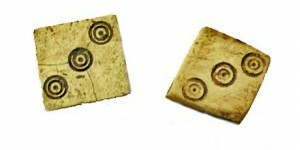 Bone Dice. Nice Large Pair.